Yosemite National Park, easily one of the most majestic places on earth one could spend a lifetime exploring the 1,169 square miles (747,956 acres) of this natural paradise. In the summer Yosemite can become extremely crowded and the nature experience is often diminished by traffic and an abundance of people, making it feel more like a visit to Disneyland than a nature experience. By contrast the winter months in Yosemite can make the park seem desolate and peaceful. Just as I have found with dirt roads the combination of snow and isolation can be a deterrent to the masses. Add that to a weekday trip and the park is virtually yours. Yosemite Valley can transform into an unparalleled land of winter wonderment when blanketed by snow. This trip took place in early February, traditionally a very wet/snowy month for northern California. Unfortunately 2013 at this point had been unseasonably warm and dry, turning the beauty of the valley from a 10 to a 9.9. Luckily a few storms had moved through the area in late December and mid January leaving about a 36" base around 7,000'. The primary purpose of this trip was to spend some relaxing time with my girlfriend in this scenic winter wonderland so a 20+ mile (round trip) cross-country ski or snowshoe trip to Glacier Point or Ostrander lake was not on the agenda. Instead we decided on snowshoeing the 3 mile round trip to Old Badger Pass Summit from Badger Pass Ski Area. 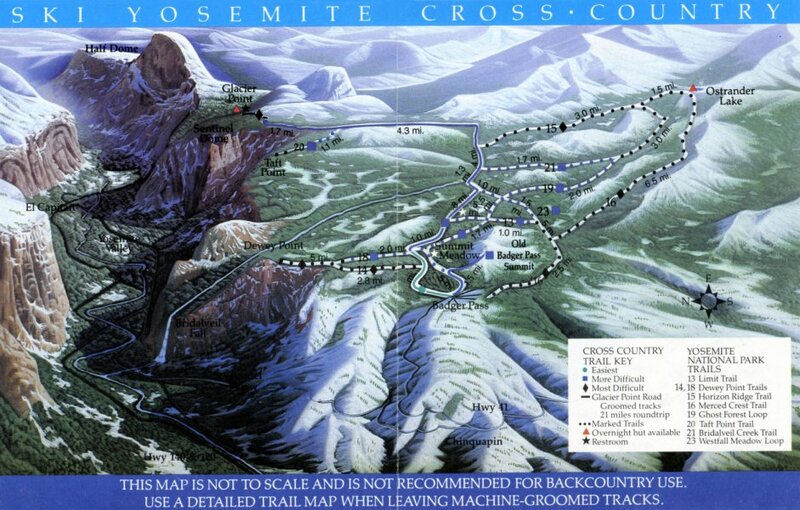 The starting point for this and many trails is just beyond the Nordic Ski Center (where trail maps are available). My girlfriend and I are flatlanders so the 7,300' elevation was immediately evident. It was a clear sunny day so warm that we had to open all the vents on our snow gear. We made our way along the trail, the only sounds that could be heard was the snow crunching as the crampons dug in. We stopped in a meadow to admire the many colors of the forest. Some trees where ringed with moss every foot or so vertically, something I have never seen before. As Old Badger Pass Summit came into view on our right we choose to take on the small hill head on instead of taking the trail around to the top. I started to zig-zag up the hill only to turn and see my girl taking the hill head on. We double timed it to the top of the summit just for fun picking up about 300' in the 1.5 mile hike. Once on the summit we sat back an took in the view. The area to the immediate south and east is part of the Bridalveil Creek drainage that begins at Ostrander Lake, picking up many small tributaries before its 617' plunge over Bridalveil Falls to the valley floor, then continuing on a short distance to the Merced River. From the summit looking N,NE it is easy to spot Mt. Hoffman, the geographical center of Yosemite National Park. Panning to the NE is Tenaya Peak, to the E is a series of domes the largest named Mt. Starr King. Looking at maps after returning from the trip I believe if I had jockeyed for position around some of the trees I should of had a view of Half Dome. There is always next time, right? After taking in the beauty of of the snow covered central Sierra Mountain tops it was time for our return trip. The 1.5 mile return trip seemed to take only a few minutes, thank you downhill. Once back at the ski resort I was surprised to see how deserted the slopes where. Badger Pass Ski Area consists of 4 lifts and a cable tow with 10 runs mostly intermediate. It is out of the way and it was a weekday but it looked like a great place to be away from the crowds I am accustom to in the Tahoe area, definitely going to come back to hit up the slopes. This trip was simple and easy for us. The weather clear and warm. Please be aware that even in these conditions the weather can change rapidly even if it's not in the forecast. Yosemite is infamous for instant weather changes. Make sure you are prepared for this type of outing including extra clothes, water, and a real map. A GPS is a good idea and like many of the trips on this site their is absolutely no cell phone reception. Please, if you enjoy this site consider using our Amazon links to shop, you get the same great price and Amazon gives us a little love. Just click on the links and shop for whatever you are looking for, and please Like Us on Facebook, thanks!